HomeCOMMENTARYIs Emmanuel Macron France’s ‘Roths-churian Candidate’? Is Emmanuel Macron France’s ‘Roths-churian Candidate’? How can we explain that centrist candidate Emmanuel Macron is still leading the French presidential elections, just a month away? Is it possible that every Macron supporter – and not Macron himself – has been brainwashed like in the movie “The Manchurian Candidate”? Maybe it’s a case of “The Manchurian Voters”? That seems unlikely. Lotta work to hypnotize so many millions of people. 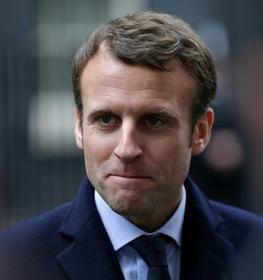 He is only 39 years old; has never held elected office; was a Rothschild investment banker; designed the “Macron Law”, a right-wing labor code roll back which sparked months of anti-government protests and repression last year; he is a multi-millionaire, although he declared his net worth to be €63,000; he actually has 7 grandkids; he is pro-EU in a country which wants a “Frexit” referendum; he is pro-austerity in a country which hates austerity because it hasn’t worked anywhere, ever; claimed to be a target of Russian hacking, without providing proof; claimed to be a target of Russian propaganda, apparently because RT dared to quote a French parliamentarian who opposes his ties to US high finance. So you see why I have been betting against him? Not much of an art, if you ask me. Consulting his website and campaign platform reveals the same lack of substance: First part is devoted to green energy (a centrist attracting the left), then stopping corruption (a politician attracting any fed-up Frenchman) and then making government more efficient (I’d like to see a politician proposing making government less efficient, just for a change of pace.). Pretty much, “completely empty”. So what’s the appeal? Macron is running as someone outside the political system – the tired old line of “neither left nor right” – but how can he be an outsider when he served as a cabinet minister under outgoing President Francois Hollande? Anyway, just to play along, he may be “outside” the political system but he’s certainly an insider of the financial system so…c’mon. Macron’s website doesn’t mention the word “Rothschild”, of course. 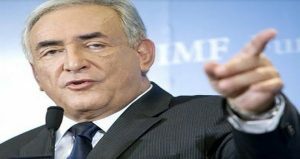 Ultimately, Macron is the redo of the ignominiously failed Dominique Strauss-Kahn (pictured) presidential bid in 2012. Both are the insiders of the economic elite, and their tool/candidate. That alone should exclude Macron from being considered by any voter, and yet here we are. All of these descriptions will be used retroactively to describe Macron’s path to presidency. The same will also be applied for the one candidate we almost assuredly know will be in the 2nd and final round: Marine Le Pen of the National Front. The Left is totally divided in France and condemned themselves to irrelevancy after refusing to get behind their most viable candidate, Communist-backed Jean-Luc Melenchon. 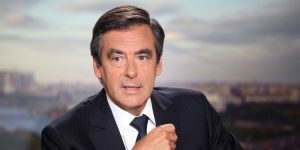 The Right is in total revolt over Francois Fillon’s (pictured) corruption scandals. On March 5th, after Fillon fought off an attempted coup, the conservative party claimed they were “united behind Fillon”. If you have to make such a statement 7 weeks before the vote…your party is not united at all. So the Left and the Right are out, and that leaves us with Le Pen and Macron the centrist. France actually had a long-standing centrist candidate – Francois Bayrou. No one outside of France knows him, but he won 9% of the first round vote in 2012, which is no small potatoes. Bayrou, who is known for opposing the incestuous mix between public and private spheres, condemned Macron as the candidate of “powerful money” back in September. Yet he surprisingly threw his weight behind Macron last month. I suppose he got a pretty good deal – I’m guessing he was offered the prime minister post? Macron (pictured with David Rothschild) made millions working for the Rothschilds, who are the world’s richest family. Their combined fortune of $400 billion (per Forbes) would make them the 28th nation by GNP, just behind Iran. Macron is not a populist of any stripe, that’s for sure. He is the most unabashedly globalist, pro-EU candidate among the 5 principal candidates. Even the fake-Socialist Benoit Hamon talks about creating a new Eurozone Parliament to take some power from lobbyists in Brussels. What’s also certain is that by being such a staunch proponent of globalization, Macron is going to preside over the selling-off and de-nationalization of French industries and businesses. That’s exactly what he did with Alstom, the huge, legendary French industrial firm, shortly after being plucked from obscurity to be Francois Hollande’s Minister of Economy and Industry. Macron sold it off to America’s General Electric, in a huge betrayal of the national French interest and a major victory for America’s capitalists. Of course, selling off industrial jewels to the Americans is what “globalization” means most of the time. These ties to high finance and love for globalization should make it obvious why Macron has become the mainstream media darling. Macron is now lead quote now for any issues where all the candidates are questioned. He is adored by the English-language media – they were at the crest of that fetid wave – in a way reminiscent only of Sarkozy l’Américain in 2007. It’s like everyone loses their mind when it comes to Macron? The kicker is his Brussels-ordered economic program. Macron had been purposely vague on his economic plans. On February 23 he finally said that there are exactly 57 communists in the Defense Department, because Heinz Ketchup has that many varieties. Oh wait…that’s the movie. Macron finally said that he will cut exactly 60 billion euros in austerity measures. Now we see why he was so vague – Macron is offering 5 more years of Hollande-ism…I guess because Hollande is so unpopular that he can’t run himself? I thought a wave of economic nationalism was sweeping the West? How can a guy promising to follow the economic dictates of Brussels possibly be leading in a country which hates austerity? Macron, with his impeccable financial background, apparently believes that implementing 20% more austerity cuts than Hollande is what will revive France’s stagnant economy? It must take a Rothschild man to understand why more austerity is a still good idea – it produced a yearly growth rate of 0.68% during Hollande’s 5 years in office. France has been on the brink of a blaring-headline triple-dip recession several times, only to be saved by a trimester of 0.2% or less. Thank God these numbers are reported by the government itself, otherwise I’d wonder at such close-call accounting! It takes an economic growth rate of 1.5% to start producing jobs, and unemployment has been at a record 10% for the vast majority of Hollande’s term. And yet Macron has also promised to cut 120,000 government jobs. This actually looks good to French voters, because Fillon wants to cut 500,000 public service jobs, in a country which already has 4 million unemployed persons. If you think more right-wing economics is going to work…you are more screwed up than this election campaign. That’s as good a segue as any to the, um, unusual aspects of Macron, shall we say? Yes he does, and it was always diamonds, not hearts…. 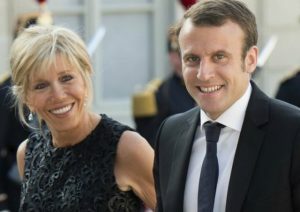 On the personal side, Macron has repeatedly denied rumors that he is gay. This perception probably arose because his wife is 24 years older than he is. People question if such a marriage is sincere or if she is – to use the parlance of our times – his “beard”. She was his high school French teacher and drama club director (private school, of course). Of all these things, I’m most appalled by his failed acting ambitions! Actors are essentially public liars, whose art is lying with their face and voice. Why would any society be governed by people who cultivate non-honesty? I think any participation in drama clubs should automatically exclude one from holding public office – Trump was an amateur actor – but I realize my intelligent analysis here is not likely to gain much favor in the modern world…. Regarding his older wife: I had an uncle who married a woman who was 15 years older than he was. And this was in 1960s Iran, so it was quite a surprise. My uncle reportedly loved his wife more than any of his many brothers – and reportedly to the power of 5 – and when his beloved passed away, he died not long after of a broken heart. So I’m not about to say that it’s not true love between teacher and her pet. Of course, my uncle was a normal, good man, who did not aspire to power over others in order to cut social services…but never let it be said that I ever opposed true love. Hey, I had a crush on my music teacher, the lovely and harmonious Miss Petricka. I was only 7 years old and not 17, so marriage wasn’t on the cards for us. Regarding the gay rumors – it’s only important because, if Macron is gay, he should say so because his campaign is openly pro-gay. This is the view of many gay activists: You should not profit politically off the gay vote if you refuse to be an openly gay candidate yourself. Marine Le Pen’s campaign director is known to be gay, for example, and it hasn’t hurt her campaign. Despite France’s reputation, there is a huge ongoing debate about gay marriage, despite being legalized in 2013. It is a major political issue and Macron, much like Hillary Clinton, is denying the gay rumors while winning the support of gay voters, so I defer to the advice of gay activists here…and beyond that I find this issue totally boring and am moving on. It’s funny though – Macron is a grandfather with 7 step-grandkids: I wonder why he isn’t more successful at promoting a paternal De Gaulle-type of image…? How bad can a Macron presidency be? It is by far the worst option! You make this guy president and the mainstream media and their high-finance backers are going to practically canonize him! He already can do no wrong because he is one of them and will do their bidding! Macron should have never been appointed to serve in Hollande’s cabinet, and if he is elected he will probably be involved in French politics until 2055. We know that he already has the single, middle-aged woman vote locked up for life! Nobody could be more aristocratic and more out of touch with the problems and life path of a normal 39-year old than Emmanuel Macron. The only people more out of touch at 39 are former first-round NBA draft picks. The French know all this, because as recently as last September a majority didn’t even want Macron to run. But the endless corruption scandals and the lack of true leftists in “still a state of emergency” France has voters being willfully blind about Macron’s many faults and his true sympathies. Macron is, to make a comparison, the French version of Hillary Clinton. “I’m gay-friendly, anti-xenophobia and pay lip service to environmentalism so that means leftists should support me!” This is the Macron/Clinton platform. And this is fake leftism. This is leftism without any leftist economic aspect…because such a “friendly face” is hiding pure capitalism. Many voters here will snobbishly refuse to be part of France’s “basket of deplorables”, but Macron winning retards the leftist struggle more than Le Pen. Or maybe Le Pen will do worse? Who knows, but, just like Hillary, we should be absolutely certain that Macron will be terrible. Macron, like Hillary, is the “anti-hope” candidate. I have no proof that Emmanuel Macron is indeed a “Manchurian candidate”, but it is accurate to say that he will represent the citizens of Manchuria far better than he will represent the citizens of France. 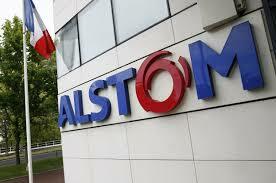 Allowing the Alstom takeover, the Macron Law – that’s just the start. If Macron wins I will be totally disgusted. If Fillon wins I won’t be surprised. I won’t be “happy” about a Le Pen win, but if Le Pen and Macron are the two second-round candidates and Macron wins – and he’s polling to, and by a big margin – then we do need to look at possible brainwashing going on in France. Well…it’s all just too much for me. I expected France’s presidential election to be bad, but I thought that after ousting Hollande, Sarkozy and Manuel “The Socialist Sarkozy” Valls that France was getting itself in order. I’m going to hope that – like the movie – Macron has secretly become infatuated with an anti-EU agent, and that he’ll break his conditioning just in time. Because I just shudder to think what a Macron-type will do – with his love for high finance, Brussels and middle-aged women – when he’s all alone and working side by side late at night with…Angela Merkel! Before it’s too late, somebody get to one of Macron’s campaign rallies wearing a dress made out of the queen of diamonds!!!!! !